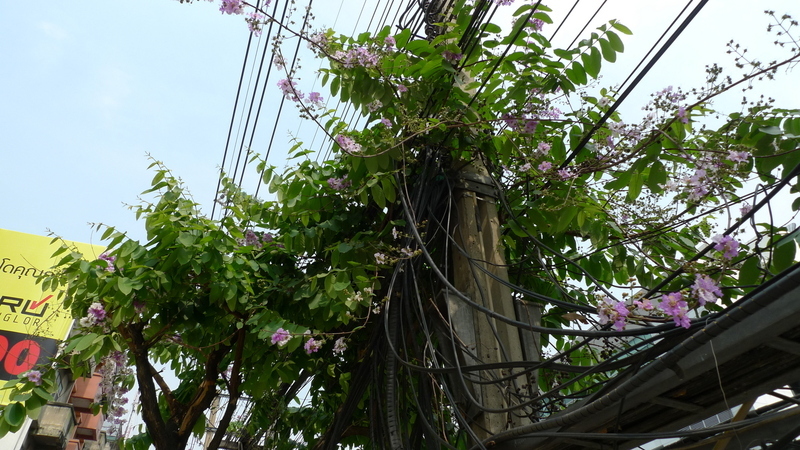 Walking along New Phetchaburi Road the other day, my eye was caught by this “man versus nature” image: the thick tangle of electric and telephone wirtes being taken over by blooming vines. Both amaze me. This entry was posted in Uncategorized and tagged Bangkok, Electricity, Flowers, infrastructure, nature, Spring, Vines, Wires by christao408. Bookmark the permalink. Dangerous stuff. Over here in America as you well know, those things never happen. Is it the modern world versus laziness ? Love the contrast! Thanks for sharing =). @catstemplar2 – That’s a good question. I don’t know if it is exactly laziness, but rather a less holistic approach to infrastructure. The other issue with Bangkok in particular is that, like New Orleans, we’re largely at or below sea level so trying to run wiring underground is especially difficult. @kunhuo42 – You’ll have to avoid Bangkok as a whole, I’m afraid! Right near the area where I snapped this picture is a pedestrian overcrossing. You climb the steps immediately adjacent to these wires and could reach out and touch them with no effort at all. I assume the wires right next to the stairs are actually telephone and not electric – those are higher up the poles… I think…@mizz_chan – @nov_way – Glad you enjoyed the picture. Don’t know how dangerous the situation might be but it reminded me of nature fighting “progress” by man. I would say that’s a gorgeous mix of two conflicting forces, but man… that’s dangerous. An interesting juxtaposition of nature and machine (technology). I hazard that as long as no one disturbs the vine or the wires harmony can endure… but a good yank on the vine and disaster! what a beautiful it’s a sort of nature made art! integrated between nature and man made technology. harmony. do you know the name of that flower? so beautiful anyway. @Fatcat723 – @fauquet – @murisopsis – It really does show that man vs. nature balance… like you said, Val, one good yank and we’ll be in trouble! @paperblanks – The irony being that the one thing that the vines need most – water – are the most dangerous thing for the wires. @a320h2017ak – Good question… I don’t know the name of the flower but will ask around and see if anyone does. goes to show how nature is resilient and can survive anywhere. @rudyhou – Isn’t that the truth? @yang1815 – Interesting question. If not electrocuted, perhaps it gets deformed thanks to the high electromagnetic field?